Seminar paper from the year 2010 in the subject English - Pedagogy, Didactics, Literature Studies, grade: 1,7, University of Cologne, language: English, abstract: Modernism is widely acknowledged as probably the most important and influential artistic-cultural phenomenon of the twentieth-century, whether it is considered primarily as a movement, a period, a genre, a style or an ideology (cf. Poplawski 2003, p. 5). 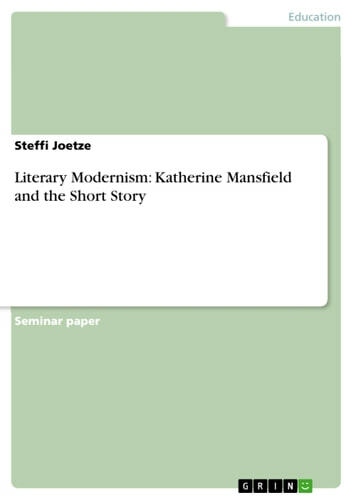 In order to find out what is so special about the literary period between 1901 and 1939 extra-literary developments and contexts as well as thematic and formal innovations according to modernism will be considered at first in this paper. Afterwards the modernist short story, as an important 'invention' of modernist writers, and its main characteristics and features are of interest. In this respect some writers of the modernist era, such as Joseph Conrad, James Joyce, Sherwood Anderson etc., and some of their short stories will be considered to get a completed picture of the topic. 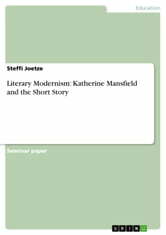 Katherine Mansfield, one of the great Modernist innovators of twentieth-century English literature, plays a central role in this regard. After a biographical overview her contribution to the 'invention' of the short story with special interest to characteristic features of her way of writing will be presented. Finally, the aim should be to explore how one of Katherine Mansfield's last short stories 'The Fly' can be used for English language teaching. At first a short plot summary and various kinds of interpretations are given to get at the real meaning of the story. Then a concrete example of classroom treatment, including a worksheet, will be dealt with. This worksheet gives attention to text gaps, which can be found within the short story, in the way that they can be seen as 'adjunctive structures' and can be used for text work in groups. What is this Professor Freud Like? Logical Greatest Quotes - Quick, Short, Medium Or Long Quotes. Find The Perfect Logical Quotations For All Occasions - Spicing Up Letters, Speeches, And Everyday Conversations.